The French Quarter's Bayona highlights international flavors. : One of the pioneers of the slow food movement, chef Susan Spicer merges local ingredients with culinary influences from the Mediterranean, North Africa, Asia and the U.S. at her signature restaurant. Large flower arrangements and white tablecloths bring a touch of elegance to the dining rooms, which are housed in a 200-year-old cottage in the French Quarter. 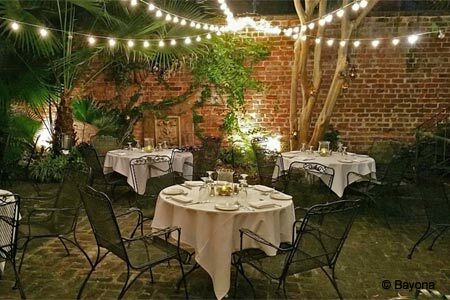 In nice weather, the courtyard seating under banana fronds and sweet-olive trees is a seductive setting. Consider dishes like a lusty cream of garlic soup, grilled shrimp in coriander sauce with a black bean cake, duck breast with pepper jelly sauce, and a pairing of tapenade with eggplant caviar. Sweetbreads are on the menu, but the exact preparation varies from time to time; the best is with sherry mustard sauce or lemon capers. The diversity extends to desserts, which may offer a crème de menthe panna cotta or Louisiana citrus and walnut baklava. Bayona's expanded wine list fields a particularly impressive Bordeaux selection, and a line-up of new-world whites of equal caliber. There are also several half-bottle offerings. For a more casual introduction to Spicer's globally inspired fare, try Mondo, a neighborhood-style restaurant in Lakeview.